Sometimes the media grabs on to buzz phrases that instill fear in the minds of our clients. The latest examples are the phrases “fiscal cliff” and “taxmageddon.” Both phrases intentionally conjure images of impending doom. They are meant to scare and that is entirely what they will do to your clients unless you get out in front of it. As Susan Weiner points out in her Your Mother and the Financial Cliff blog post, it’s a mistake to assume clients and prospects understand financial vocabulary. These terms may roll off the tongue easily, score millions of Google hits, and be repeated ad nauseam on the news, and still be misunderstood. You have a fiduciary responsibility to focus on education. 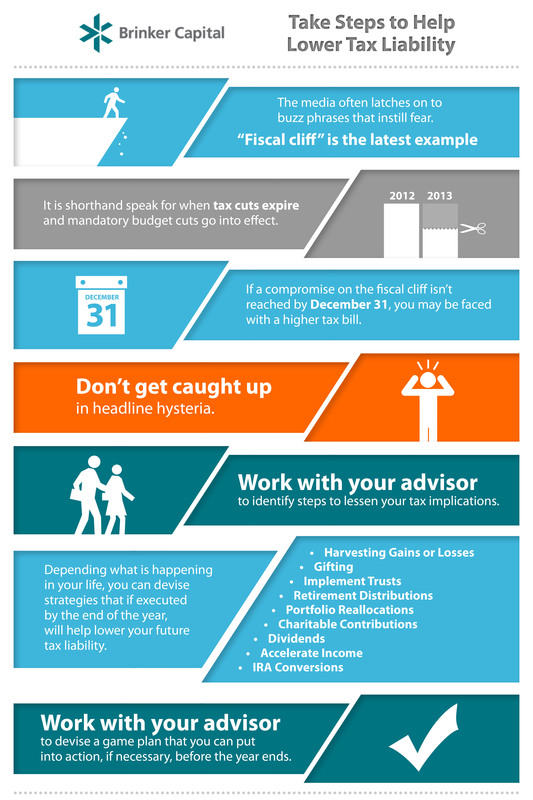 Let clients know what the fiscal cliff means to the country and to the economy. A good article to reference is What You Need to Know About the Fiscal Cliff, written by Morgan Housel for Daily Finance. Your clients will look to you to size up the potential impact of the fiscal cliff on their portfolio and their life goals. You should be the person that delivers this news, rather than letting them stumble upon the MyTaxBurden calculator on the web (this calculator models an individual’s federal tax burden under three scenarios: full expiration of Bush-era and Obama tax cuts, the Republican plan to extend Bush-era cuts, and President Obama’s plan partially to extend these cuts for families making under $250,000 per year as well as extending tax cuts in the 2009 stimulus bill). In the weeks remaining after the election and before the end of the year, the Congressional drama will unfold before us. Your client should be well informed as they observe the discourse just how critical the issue is to the country’s overall economic health. A “cliff” conversation now gives you the opportunity to outline potential strategies that will help minimize the client’s 2013 tax burden if a compromise is not reached. They should also have confidence that no matter the outcome, you will help ensure that they are best positioned.